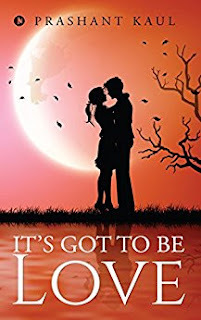 ShammingSituation: BOOK REVIEW - It's got to be love by Prashant Kaul. BOOK REVIEW - It's got to be love by Prashant Kaul. Meet Dev Sharma, a young student, who has a unique ability – he has nightmares that unfortunately come true. It’s Got to Be Love weaves around Dev and his friend Vikram. Dev is initially smitten with Carol, a college girl, but due to various reasons, they part ways. He meets Vaani through Facebook and a steady friendship develops between them, which soon blossoms into love. However, Vaani turns down Dev, for reasons known only to her. Will Dev win back his love? Will Carol come into his life again? Join Dev on his emotional roller-coaster ride in Chandigarh, Delhi and Mumbai. Writing a love story is the most difficult task in today's time. Prashant Kaul just manages to do it with appreciable flamboyance. To Start with the cover page of the book shows an insight into the the everyday life of Dev whoo rows without the company of his parents and is thus just like a sapling that grows without the shade of a tree. As we read more the novel turns into a quirky narrative pf Dev's love episodes and how he tries to find solace in them, but in vain. The story strarts with a bang but became quite slow in the mid and as the reader proceeds towards the ending the book turns out to pick its lost pace. To begin with the actual review, the cover is catchy enough and the reader shall pick the book up just after looking at it once, the blurb as compared to the story gives an apt jist of the entire story. The editing failed to get all the marks, as i feel i could actually find some major flaws in the punctuation and grammatical errors. Overall the language is lucid and will keep the readers hooked to the book till the very end. For me this book has all the qualities to turn into a movie.